Unlike the global version (using Samsung's own Exynos silicon), the Galaxy S7 active is powered by the latest Qualcomm Snapdragon 820 CPU (as are all North American variants) paired with 4GB of RAM. The Snapdragon 820 features two dual-core Kryo chips. The first is a dual-core chip which maxes out at 2.15 GHz and the second dual-core chip maxes out at 1.6 GHz. The Snapdragon 820 is Qualcomm's first departure from 8 cores down to quad-core territory, don't be fooled by that number though, a single Kryo core is a beast and what separates it from previous Snapdragon chips is its new architecture which combines improved efficiency with overall better performance. A generous 4GB of RAM and the Adreno 530 GPU joins the Snapdragon 820 to give the S7 active a great deal of performance power under all that rugged exterior. Let's see how the S7 active performed against other top competitors. Since the S7 active is only available in the US, we're going with mostly high-profile flagships available in the US. For starters, the Galaxy S7 active's single core performance fits right in among the other Snapdragon 820 devices on the market. Still, the iPhone 6S' A9 chip dominates this chart in single core calculations. Here is where we can see the raw calculating power of the global Galaxy S7's Exynos CPU. Much like the single core test, we can see the Galaxy S7 active fall right among the other phones fitted with a Snapdragon 820. Here we also get a glimpse of how the quad-core 820 fared against the octa-core Exynos 7420. While there is a bit of an improvement, it's not too significant. The Galaxy S7 active falls average among the other Snapdragon 820-powered smartphones of the bunch. Antutu 6 is a compound benchmark that takes into account all aspects of the system as opposed to just raw CPU processing. A combination of factors like optimization and tuning contribute to the Antutu 6 marks, and the Galaxy S7 active is beaten by the OnePlus 3 and HTC 10, which topped this chart. For our Basemark OS II 2.0 test, we can see the Galaxy S7 active reaching high above the other flagships. Even with the Galaxy S7 active having the same setup as some of the other flagships, it looks like Samsung's RAM optimization and CPU thresholds set it up well for this particular benchmark. GFXBench is an OpenGL ES 3.1 test which measures graphics performance, and the offscreen tests run at 1080p resolution, regardless of the pixel count found on the display of the device being tested, giving all graphics tests an even playing field. 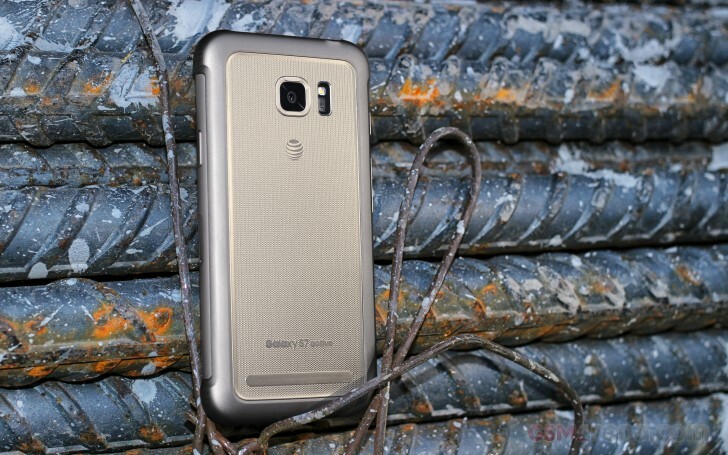 The Galaxy S7 active performed at the top, although most devices on the list scored 30 or 31. The next test runs in the phones' native resolutions and those with higher-res displays are pulled back by the benchmark numbers. Since the OnePlus 3 and Xperia X Performance both run 1080p resolutions on their displays, they get about twice the score as the competing QHD resolution phones. The Galaxy Note5 stuck behind with last year's Exynos setup. The GFX Car scene is round-two for the flagships to duke out graphic performance. The offscreen tests (also rendered at 1080p) score significantly lower than the Manhattan tests since the car scene turns the knob up a notch. The S7 active topped the chart along with the HTC 10 and OnePlus 3. Meanwhile, the Galaxy S7 with Exynos hovers around the bottom. Much like the Manhattan test, the Galaxy S7 active's onscreen test is pulled down by its native QHD resolution. Still, it performed at the top of its class with other QHD phones that run the same Snapdragon 820 setup, and it performed better than the Exynos-powered global S7. Basemark X is a benchmark which lets us gauge how they are performing with the other contenders of the bunch in the gaming aspect. The S7 active scored well around other Snapdragon 820-powered phones and performed quite similarly to the Exynos-powered S7. Samsung did a great job of leveling the performance of both chipsets. Basemark ES 3.1 offers a testing field for OpenGL ES 3.1 compatible devices that aren't necessarily on the same platform, namely: iOS and Android. The Metal Basemark for iOS gives us an idea of where the two platforms stand relative to each other. The Galaxy S7 (Exynos) scored notably higher than the S7 active and the other Snapdragon 820 devices as well. The iPhone 6S still reigns this test although it's really hard to compare Apples to Androids in these kinds of tests. It's worth noting that the Galaxy S7 active dissipates heat differently than any of the other flagships out this year. Since the back plate of the S7 active is made of polycarbonate, it's not such a good heat conductor like glass or metal. The S7 active has to depend on its sides to dissipate heat. When performing CPU or radio intensive tasks, the upper-right side is the one which gets quite warm, though, not uncomfortably warm. The Galaxy S7 active performs just as well if not better than the other flagships powered by a similar Snapdragon 820 setup. Day to day activities run like cake and the generous 4GB of RAM ensure that you're much less likely to have a slow phone upon switching back and forth between apps. Remember, the Galaxy S7 active is also a result of Samsung pushing out CPU optimizations and updates over the past few months since the release of the Galaxy S7 (Snapdragon variant in North America) and other Snapdragon 820 devices which were reviewed with initial versions of public firmware.